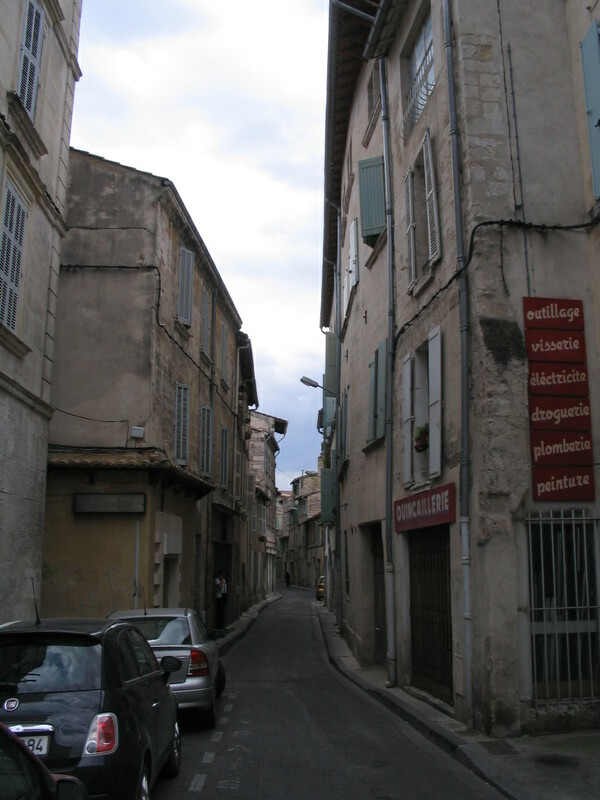 The last part of my Avignon exploration brought me through the extra-dense heart of the old city. 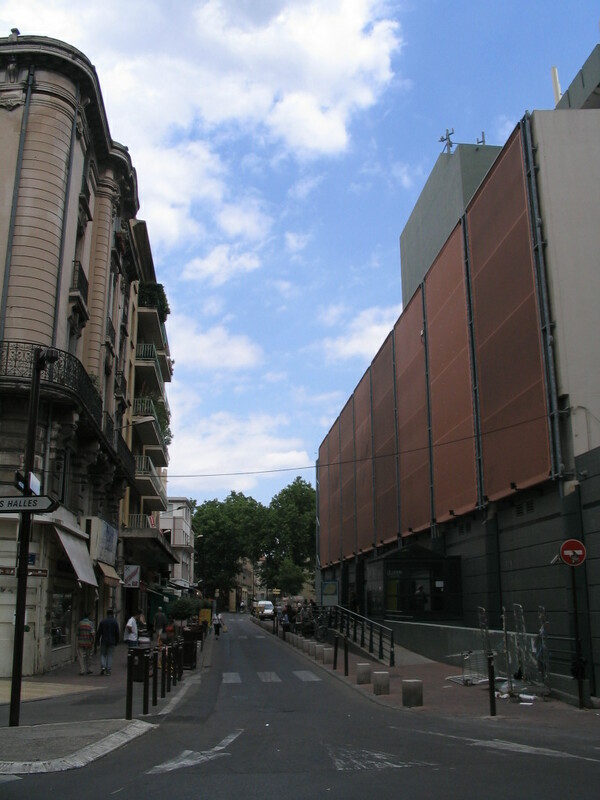 A dynamic composition of panels at the southwest corner of Rue Thiers and Rue Philonarde. 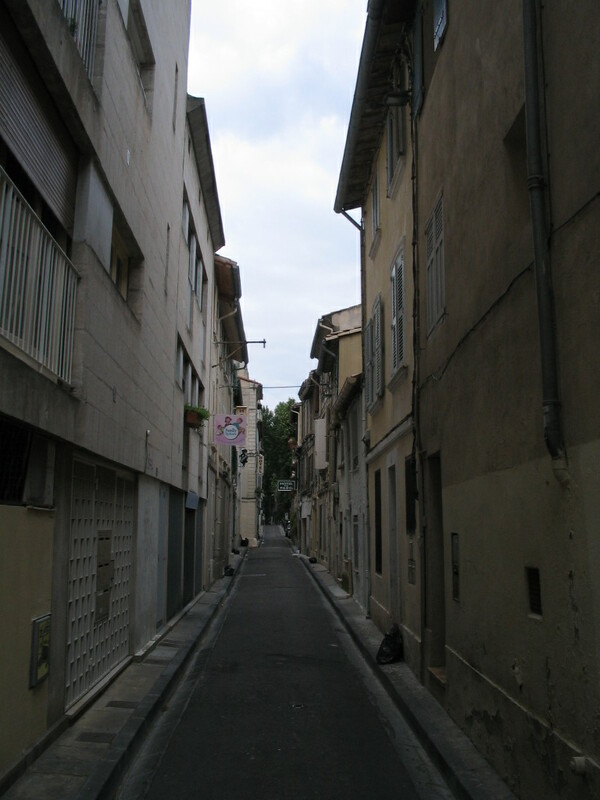 Mysterious light along Rue Four de la Terre as seen from Rue Thiers. 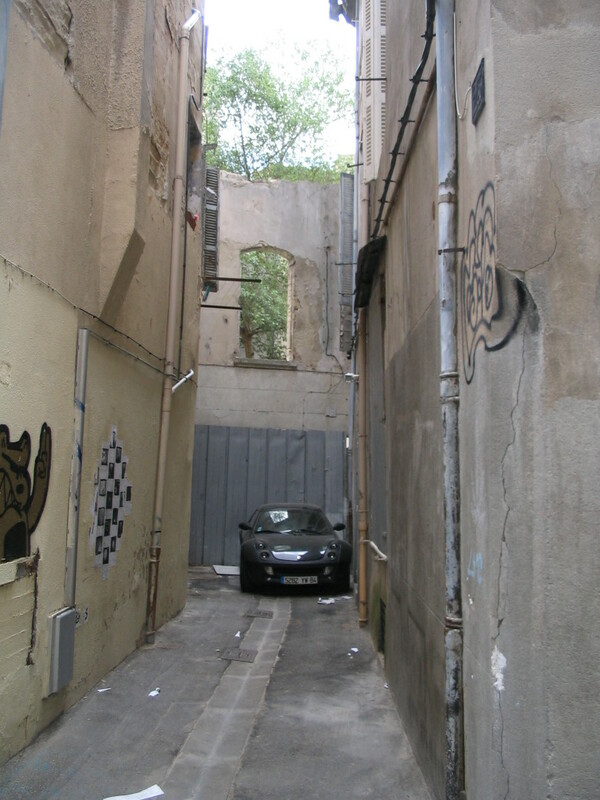 This car off Rue Amphoux reminds me a bit of a crouching spider, partly due to its multi headlights. 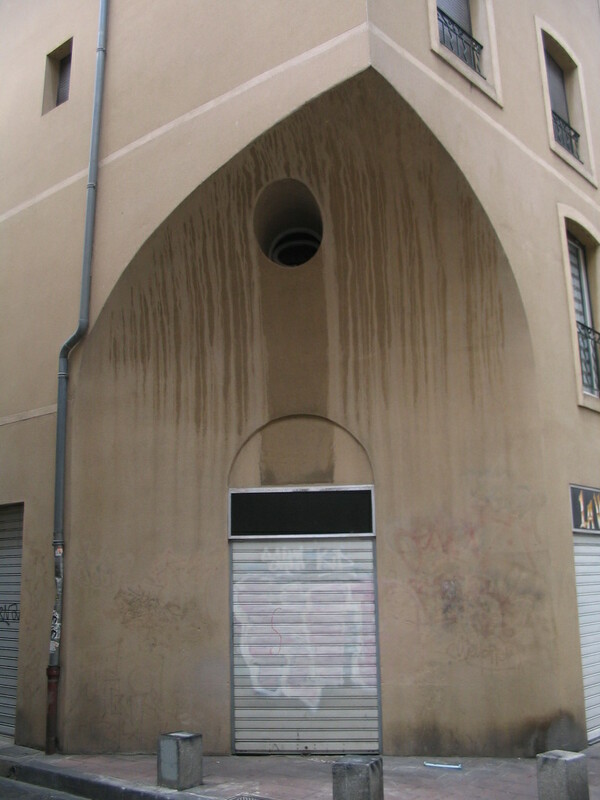 ...it's an enormous slice out of the corner of this building at Rue Artaud! Much bigger than any I'd seen in the Engadin, and with its own door and window no less. 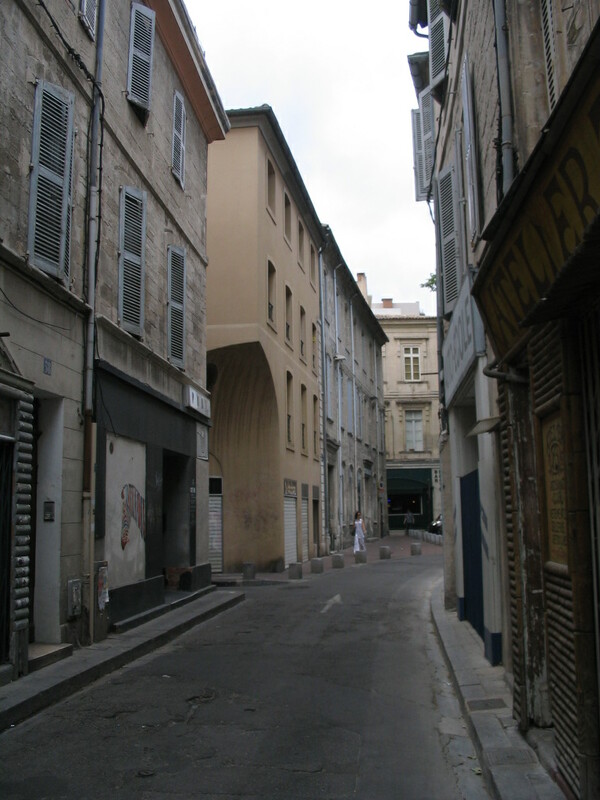 Now back at Les Halles; this is the more demure west side, along Rue Petite Meuse. ...whoa, I guess so!! 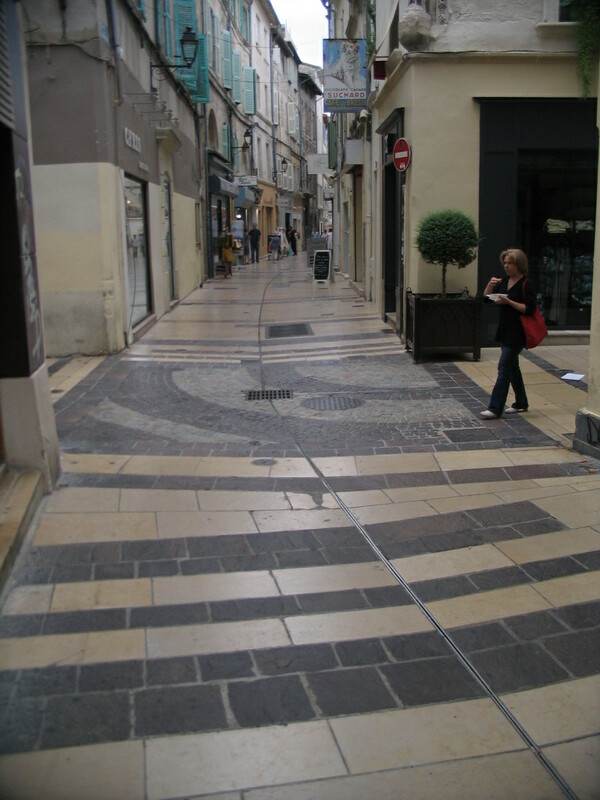 This is looking south on Rue des Fourbisseurs across Rue Bonneterie. 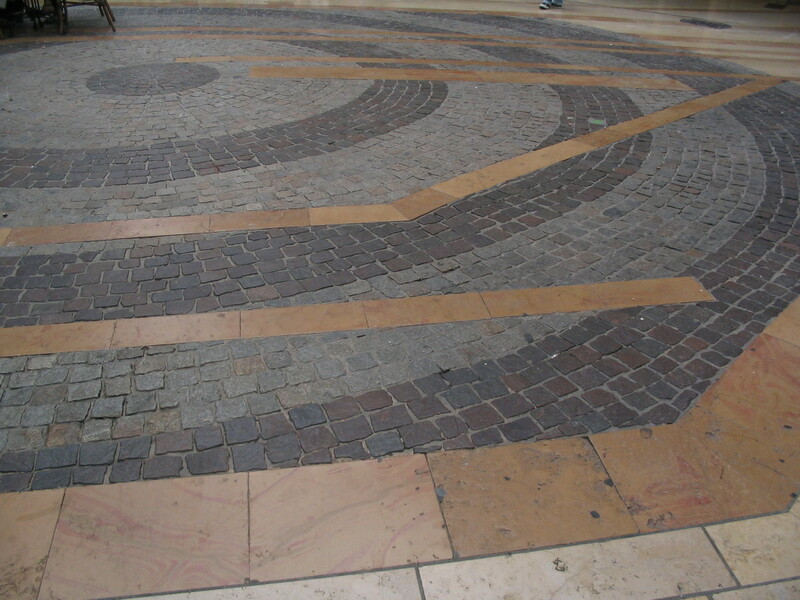 The shop streets in this core area all have this fantastic paving; it's basically a neighborhood-sized artwork. 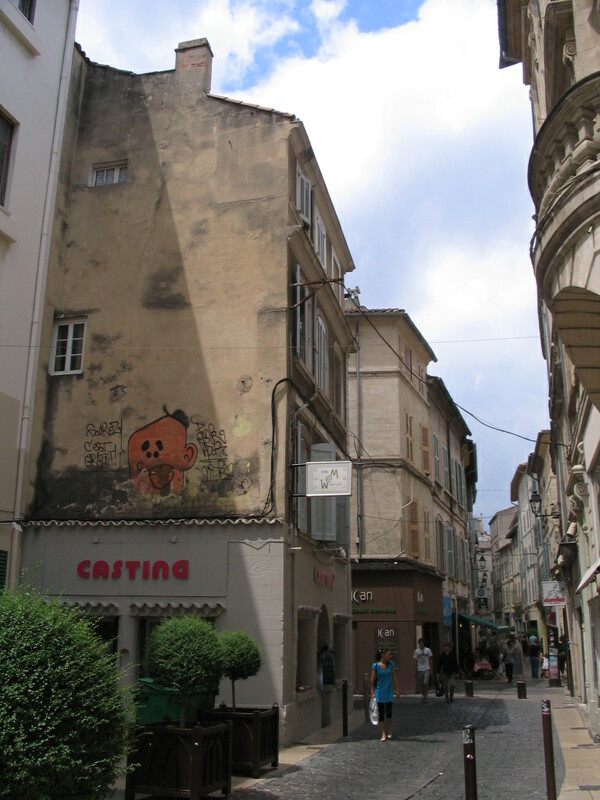 This is the Place du Changé, at Rue Rouge and Rue Rappe. 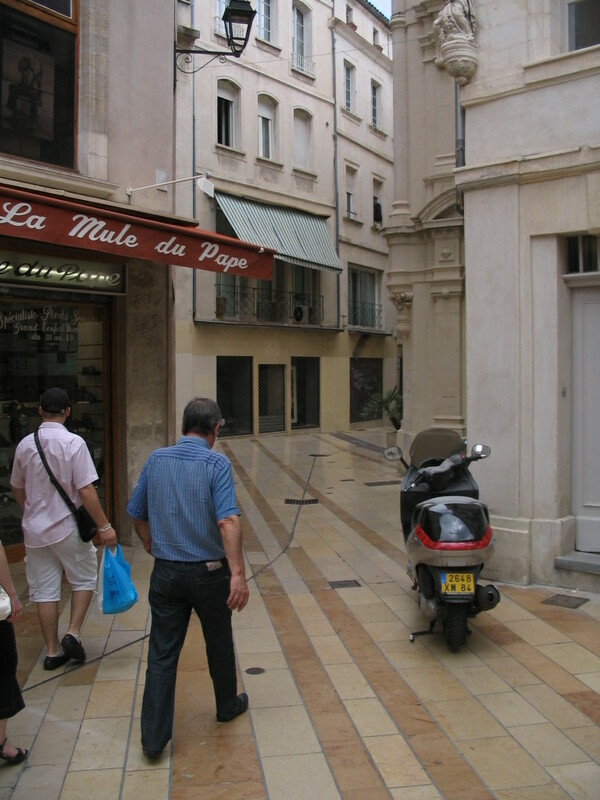 Diagonal pavers leading between the jagged edges of Rue Rappe from the Place du Changé. 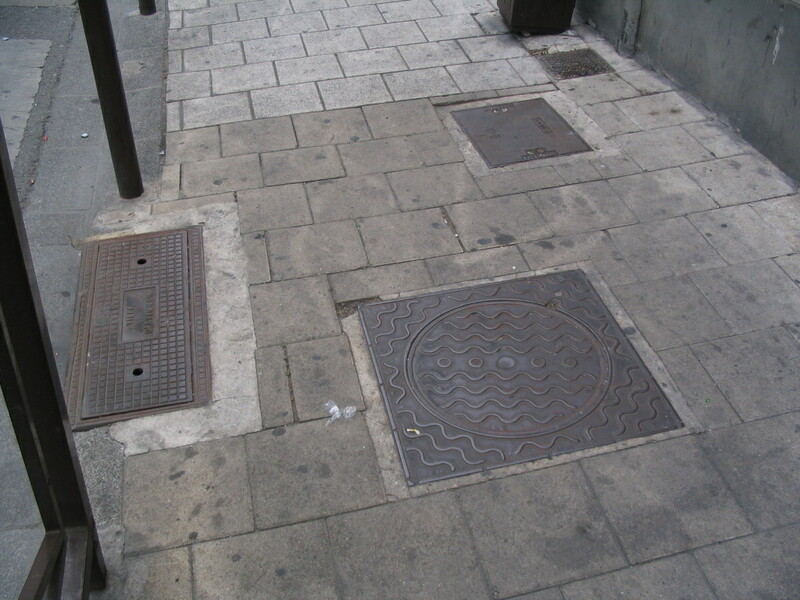 Also interesting to keep seeing these metal expansion joints in the middle of the street. 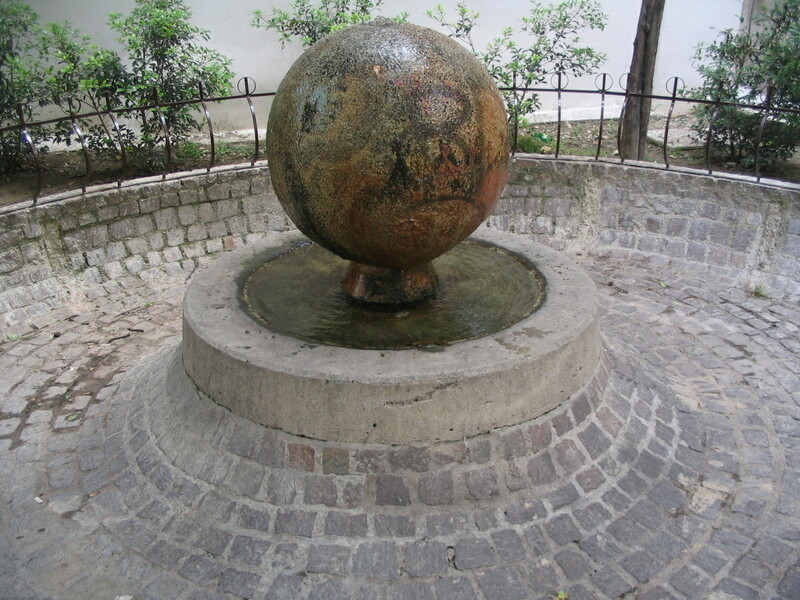 Probably along Rue des Faucons, a most curvilinear of fountains. 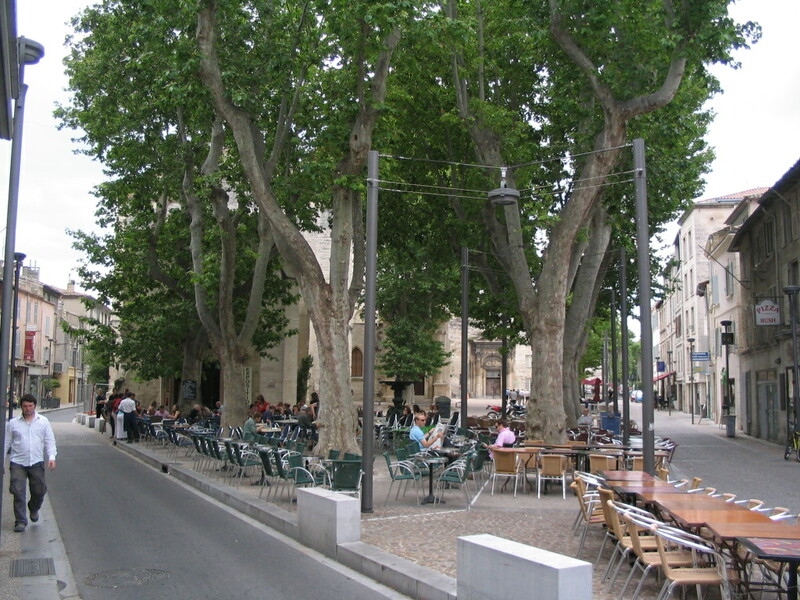 Back to the Place des Cours Saints near the hotel, with the Église des Célestins behind the sycamores. And then back to the hotel (can you read the sign?) 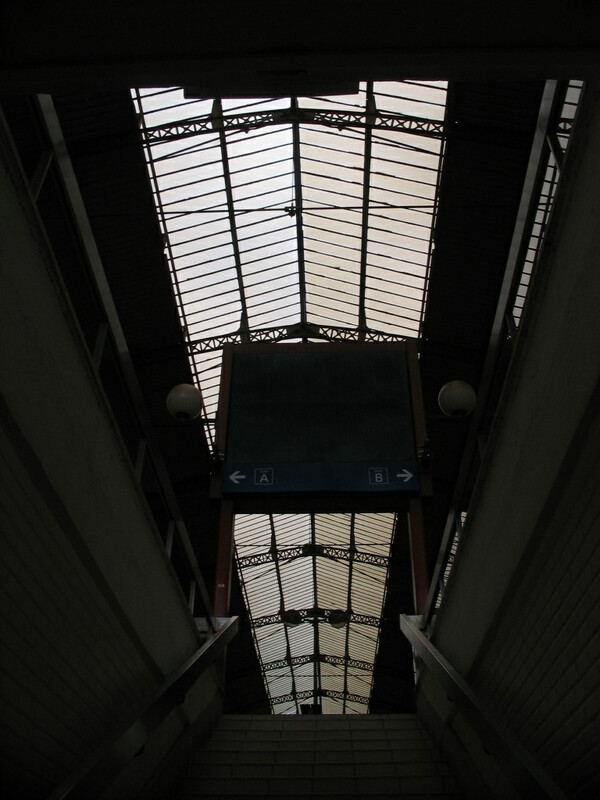 to gather my belongings and head back to the Gare to depart for Spain. Emerging into the trainshed under the openwork roof.